So good is the Master System edition of Columns that, for a time, it threatens to upstage the Mega Drive version of the beloved jewel-bursting puzzler. In the final reckoning, a few design oversights deny it top billing, but it remains a superb puzzler that 8-bit fans will love. 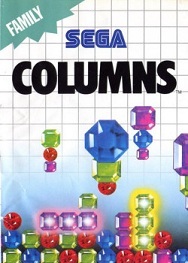 Essentially SEGA’s answer to Tetris, Columns tasks the player with placing vertical stacks, each containing three jewels, on a board, with the aim of lining up three or more of the same colour, either horizontally, vertically or diagonally. Successfully align such a sequence and the jewels explode, granting the player points and valuable space. Should you fail to stem the tide of jewels and they pile up to the top of the screen, you guessed it, it’s game over. There’s an awful lot to like about the Master System version. Firstly, it has its own style visually. It captures the colourful, eye-catching essence of the 16-bit iteration whilst simultaneously moving away from its garish Egyptian themes, adopting instead a simplified look that’s both neat and refined. You’re not limited to lining up jewels either; there’s the option to change the icons to fruit, coloured blocks or, if you really want to hurt your head, numbered dice. It plays really well, with nine speed levels proving just enough of a gradient for the player to work their way in before the barrage begins, although it does mean the incremental score increases halt significantly earlier than its 199 level Mega Drive sibling. It then goes one better with a host of new game modes. ‘Flash’ challenges the player to remove a designated jewel from the bottom row of the screen as quickly as possible. A simple principal, but the nature and difficultly of the challenge can be altered through placing extra stacks atop it and setting the action to different speeds. Two-player 'Versus' should not be understated either; it’s simple mechanic of players trying to create big enough scoring reactions to cause an adverse effect on the others’ board (in this instance, the bottom of the board being pushed up a row to cramp the space until they can respond with their own scoring). Essentially, it acts as a precursor to the ‘Vs Puzzler’ games of Dr. Robotnik’s Mean Bean Machine and later Puyo Pop. There’s even a two-player cooperative that sees control switching from player to player after every set of jewels is placed. It’s frankly bonkers when the speed gets up, but a good laugh. Indeed, Columns seems to have all the bases covered for a diverse and definitive 8-bit puzzler experience, which makes the presence of some eminently avoidable errors all the more difficult to stomach. The most remarkable oversight is the lack of high-score boards, challenges, or indeed any other kind of performance recognition whatsoever. Columns has an abundance of great ideas, but nothing tying them together. You can plug away amassing a momentous score, but when it's Game Over, you're sent right back to the title screen without so much as a cursory acknowledgement, which is disappointing as the scoring really is the sole purpose of this mode of play. 'Flash' had the potential to give Columns legs had it have come up with a range of challenges with different block conundrums, speeds and time-limits, but again, much as with the Original mode, you’re offered little guidance and even less tangible reward for besting such conundrums. Whilst neat and pretty, the jewel-board itself is guilty of occupying rather too little of the screen, and as a knock-on, the icons are just a little too small, making differentiating between rows and gaps on a busy looking screen rather more of struggle than it ought to have been. It's especially frustrating as these niggles really weren't an issue with other versions of the game. It does start to get away from the player by Level 9 as well, as the controls feel less responsive and trickier to judge as the jewels absolutely hammer down, making your demise swift if you make a wrong move. But it’s still hard to resist a game that's got so much 'pick up and play' appeal to it. It has aged absolutely beautifully, and the new modes reveal a new side to Columns, one that shows it can play really well outside of its tried and tested ‘score until you’re finished’ comfort zone. Is it a match for Tetris? That’s one giant headache disguised as a question, because preference has a lot to do with it. If you find matching blocks more edifying than forming lines, or find symmetry to be of secondary importance to building and bashing down towers of combos, then Columns should certainly be on your radar. There’s something perfectly satisfying about reeling off big combinations through shrewd block placement, and trying to stay one step ahead when the blocks start to really speed up, as you're often just one mistake from disaster. There’s a cerebral, almost graceful charm to it, in no small part down to the beautiful Clotho and Lathesis chimes that float along with the gameplay. It’s not perfect, but Columns is pure playability and, for a Master System title of the early nineties, pleasantly adventurous in both its themes and its content. Really good. "It has aged absolutely beautifully, and the new modes reveal a different side to Columns, one that shows it can play really well outside of its tried and tested ‘score until you’re finished’ comfort zone"